What’s below is a seven-minute segment Rep. Alan Seabaugh (R-Shreveport) did with KEEL radio this morning discussing the current state of Louisiana’s ongoing budget wars and the “fiscal cliff” the state faces of some billion dollars in shortfalls. If you’re interested in the reality of the state’s fiscal situation rather than the contrived narrative Gov. John Bel Edwards and his allies in the state’s legacy media have been pushing, you might find it enlightening. Seabaugh’s perspective is that the “fiscal cliff” is one of Edwards’ making. As he notes, the final budget passed during Bobby Jindal’s tenure as governor was more than $3 billion smaller than the one Edwards is screaming is underfunded, and the state’s institutions weren’t shut down or permanently damaged in that time. 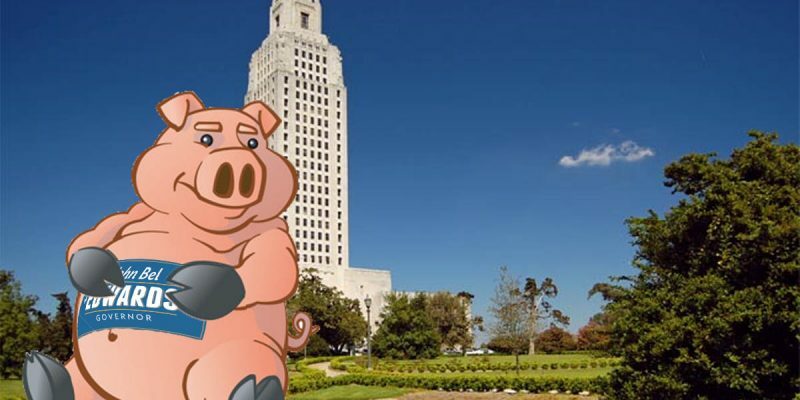 Edwards has rapidly grown the size of Louisiana’s government, partly through Medicaid expansion financed by Washington dollars but not wholly, and the governor’s complaint of a fiscal shortfall rests completely on that growth in spending. And therefore Edwards’ demand for tax increases to balance the budget isn’t fiscal responsibility. It’s the opposite. As Seabaugh notes, the “fiscal cliff” comes chiefly because of the scrolling off the books of the state’s “fifth penny” of sales taxes passed on a temporary basis in 2016 when Edwards first took office. That “fifth penny” would not have passed through the legislature on anything other than a temporary basis, and it’s now set to expire. Therefore, any attempt to replace it is by definition a new tax, and as Seabaugh notes if the legislature were to do nothing Edwards would then be forced into making budget cuts to match the state’s revenues. He says there is some Republican support for leaving the “fifth penny” of sales taxes in place though he’s not part of that crowd; the reason there are Republicans willing to reinstate the sales tax number is their constituents aren’t complaining about sales taxes – the Democrats in the legislature are the ones with complaining constituents, and from the perspective of some of these Republicans it’s pretty good politics to stick it to your opponents’ voters where you can. Not that it’s good policy, of course, but when Edwards continuously puts, for example, the TOPS program on the chopping block knowing that the burden of TOPS cuts will fall mostly on middle class parents of college kids who are likely Republican voters, it’s understandable that Republican legislators might use the sales tax as a retaliatory measure. And that’s where we are with this governor and the legislature. As there will be no meeting of the minds on matters of principle and ideology, the fight to come will be about leverage. In this, the question is whether there is sufficient will in the House of Representatives to do nothing. Because if the House stands pat, Edwards will be forced to cut the state’s budget by some $900 million or so. This is highly doable, though it’s the last thing the governor wants and he will attempt to make the cuts as painful as possible to the people of the state in an effort to paint the House as the bad guys (we’ve talked often about the Washington Monument strategy this governor employs ad nauseam; get ready to see it again), so the question is whether the legislators are willing to vote no on Edwards’ tax increases anyway. Finally, this is the plan Edwards sent out via e-mail to the legislators calling for tax increases to solve his “fiscal cliff.” He wants to slap four percent sales taxes on things like satellite and cable TV bills, home repairs, debt collection services and a host of other items, as well as four percent sales taxes on business utilities. The document is full of hard-to-swallow claims like Edwards has cut millions from the state’s budget, but it’s an indication of his demand to the legislature. We’re going to see some very contentious times ahead at the State Capitol.